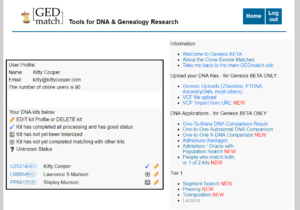 At my recent GEDmatch talk for i4GG, I warned the crowd that soon Genesis would be the only place at GEDmatch where you could upload new DNA kits. Well that day has actually come! 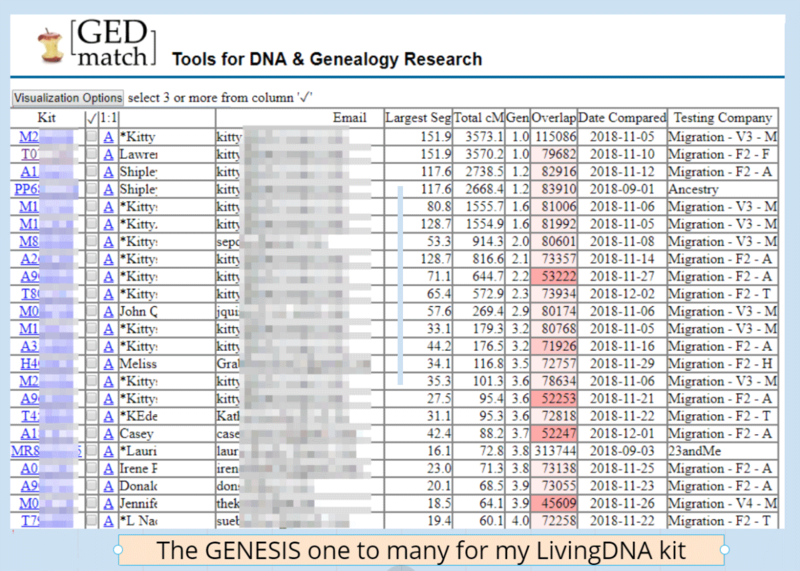 Although your kits will migrate from GEDmatch, you may want to upload to Genesis if you cannot wait to see the comparisons. By the way, your GEDmatch login will work just fine at Genesis. 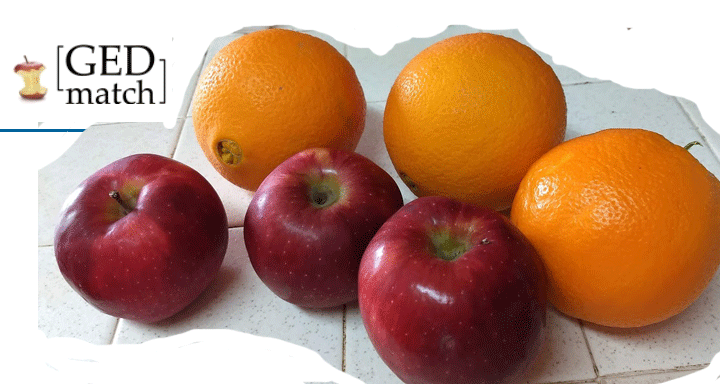 Note that Genesis has the GEDmatch logo with an apple core next to it. So why do you have to move to GENESIS? The problem is that some companies are using newer chips which test for different not completely overlapping markers: LivingDNA and 23andMe since August 2017. Why you may ask? Because the new chips test more SNPs and have more non-European ethnic coverage. Notice that the last three columns are new. One shows how many SNPs overlap between the kits (in other words, how many SNPs are in common between the two sets of test results so can be compared), the next shows the date compared, and finally the company where the test was done is listed. The latter is needed because kits uploaded directly to GENESIS get assigned kit ids that start with a pair of random letters so the origin is not known from that. Note that migrated kits keep the A,T,M, and H single letters. Also many recently migrated kits will show an overlap of 0 because that has not yet been compared for them. You may also notice that many columns are missing like haplogroups, gedcoms, and X matching; nor are the columns sortable. Hopefully these features will be added back soon. The display is more compact with the confusing clickable L replaced by clicking on a kit number to see its list of one to many matches. 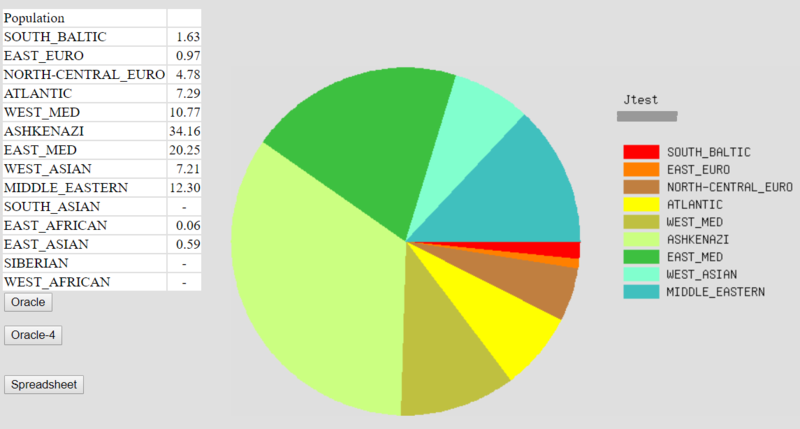 By the way the Tier 1 version of the one-to-many looks exactly the same as the one on GEDmatch. 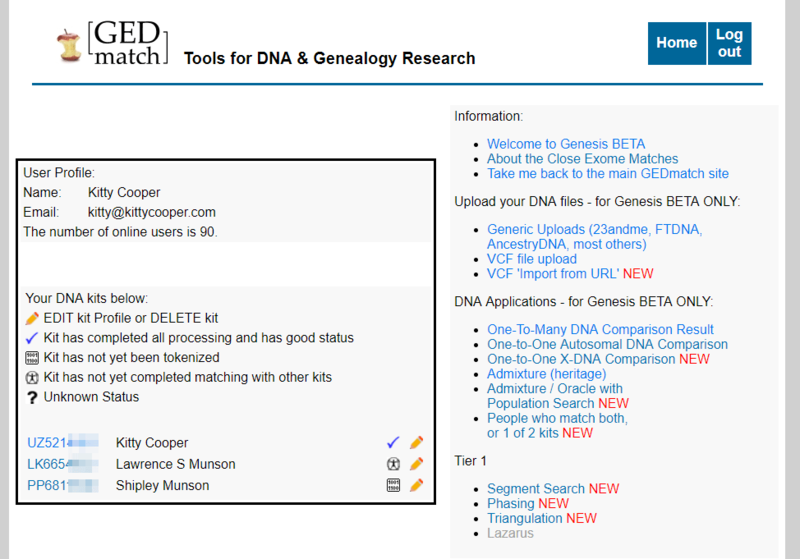 Today GEDmatch launched a version of my segment mapper which is integrated with their database. It can be used as a way to easily visualize multiple matches on GENESIS. This first version shows how everyone compares to the first person on the list, like the current 2D chromosome browser but more compact. Also each color is a person. One way to get a display like this at Genesis is to check the boxes (tier 1 only) next to your best matches in the one-to-many (up to 40 of them) and then click the button “Visualization” at the top of the page. Another way to get there is to use the Tier 1 tool “MultiKit Analysis” and select the kits you want to look at. Remember the first kit listed is the one that all the others will be compared to. Although its creator has disavowed the Eurogenes Jtest calculator for listing your Jewish percentage (click here for his article), I find that if you add up all the obvious ethnicities: Ashkenazi, Western_Med, Eastern_Med, West_Asian, and Middle_Eastern, it is not that far off. The Jtest image above is from Martin, the only person I have ever seen AncestryDNA call 100% European Jewish; most of my jewish friends come out between 87% and 98% there. 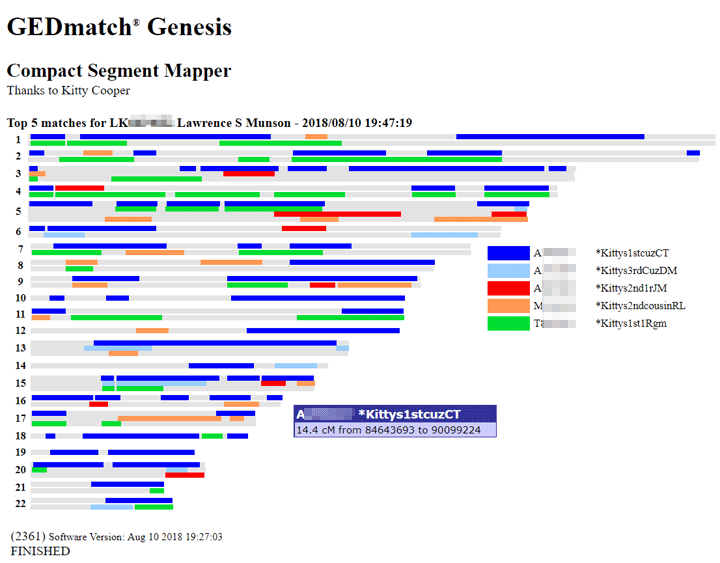 Click here for the creator, Davidski’s Eurogenes blog posts on Gedmatch. Two important take-aways for me are that his ancestral clusters are much further back than the main companies and any ethnicity of 1% or smaller is likely noise. Once your kit has tokenized, you can start using the most important tool, the One-to-many compare function which will compare your kit to all the kits in the database and then list your closest DNA relatives. Technology never stands still. The latest change affecting all of us who love using DNA for genealogy is a new chip from Illumina. The past six or so years of autosomal DNA testing have shown that the current chip is great for testers with European ancestry, but does not have enough SNP coverage to figure out the details of the ethnic make up for people from other parts of the world. Many more and different SNPs are tested in this new GSA chip. All the 23andMe tests done since this past July use that chip, as does Living DNA (highly recommended if you have British ancestry since it does local regional breakdowns). I imagine eventually the others will follow along. The bad news is that there is not that much overlap between this chip and the previous ones, which affects cousin matching. Because the SNPs are so different the DNA results from these kits cannot be uploaded to GEDmatch, however our friends there have built another site to handle these new kits called GENESIS. They have come up with a whole new algorithm for relative matching that works with lower SNP counts. The functions available at GEDmatch are being gradually implemented at GENESIS. Most of the key ones are there now. Plus there is some new functionality. One major addition is the showing of the number of SNPs actually overlapping between kits. Very important to know since the overlaps can be as small as 108,000 SNPs or as large as 580.000. My previous post about tag groups mentioned that tag groups are a quick way to see where a new match fits in by looking at their one to many page for your tag colors. However this is less useful for a distant cousin match (fewer colored tags) or an iffy paper trail match. In those cases I put the new person in my Unknown group (which only ever has the one person being analyzed) and then compare with all the relatives I expect a match to, by using their tag groups. 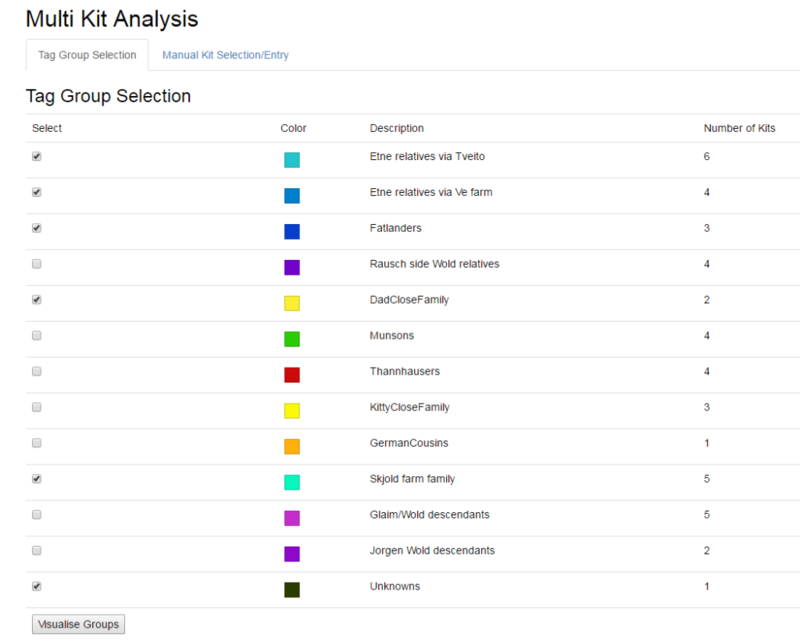 The main GEDmatch page has a box called Analyze Your Data and towards the bottom of that box you can see Multiple Kit Analysis with a big red NEW next to it. The “new” is because you can now use tag groups for this analysis. When you click Multiple Kit Analysis to get to that function, you will see a page like the one shown below. The old way of doing multiple kit analysis, by typing in each one, is still available from the Manual Kit Selection/Entry tab on this page or by checking boxes in various other functions like one-to-many. You can check the tag groups of interest and compare them to the new person (the Unknowns group for me) in all the wonderful ways the multiple kit analysis gives you (Click here for the slides on that from my most recent GEDmatch presentation). Recently I have been searching for a “Lee Oleson” who is the grandfather of a third cousin match at Ancestry. He was only in town long enough to get my match’s grandmother with child. This third cousin’s one to many lights up with the colors of my Etne, Hordaland, Norway side relatives. So I set myself a project of tracing forward all the descendants of the eight children of my Etne great-great-grandparents to see if I could find Lee.